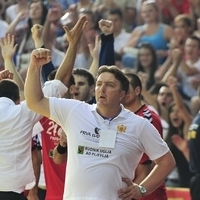 Less than a week before their VELUX EHF Champions League match at home to PSG Handball in round three, Macedonian champions HC Vardar have parted ways with coach Zoran Kastratovic. After just three months in the job, this decision was a surprise for many. Vardar are scheduled to play Nexe in the SEHA league on Wednesday and assistant coach Andon Boskovski will take charge for the game. Newly appointed club president Sergej Samsonenko announced the unexpected news at a press conference on Monday, just two days after Vardar celebrated victory in Novi Sad against Vojvodina. “We would like to announce that Zoran Kastratovic is no longer head coach of Vardar. I think that Kastratovic is great coach and wonderful person, but we have made our decision. “Our temporary solution will be assistant Andon Boskovski, who will lead the team against Nexe,” said Sergej Samsonenko. The decision was made shortly before the press conference after a meeting between the president of the club and coach, as they discussed the latest results and achievements. Kastratovic led the team to a draw with Barcelona in the first round in Europe and followed it with a narrow defeat in Minsk versus Dinamo. The club currently sit second in the SEHA Southern Stream league, with 10 points from five games. “The contract was terminated at the request of the club. I have no further comments about this. For everything else you need have to ask the president of the club,” briefly commented Zoran Kastratovic. They face PSG at home on Sunday, 13 October in their hunt for a first win of the campaign.